Did you know that many of us will spend a quarter of our lives at work? If you work in an office, you’ll know that there’s plenty of time and plenty of reason for the office to get dirty, and that this makes work less pleasant than it needs be. At Friendly Cleaners we offer a comprehensive office cleaning service perfect for any workplace or corporate environment. With so many people coming and going every day, it doesn’t take long for an office to show signs of grubbiness and dirtiness, which could be bad for business! With Friendly Cleaners maintaining the clean condition of your office is simple. We are among the most trusted office cleaning providers around London and we serve a variety of business properties such as bank institutions, corporate offices, public and retail institutions, etc. The office cleaning service we provide is designed to be helpful for every individual customer. This is why we tailor different checklist for every project to be far-reaching and quick in our work. Here are no long-term contracts and obligating clauses. You are getting paid for the service done with no hidden costs. Our policy is transparent from beginning to the end and for your convenience you can choose among several payment methods. The office cleaning is flexible service, so you can pick convenient booking time outside the working hours and that includes the weekends and holidays. For you will be employed devoted, qualified and experienced experts. 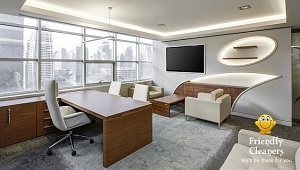 They can clean all types of office along with the gentle electronics such as computers, printers, fax machines and others. With our office cleaning your workplace will become more welcoming and pleasant for the employees and the guests. Friendly Cleaners you will get cost-effective and professional office cleaning responsive to your requirements and needs. We have teams of qualified cleaners working every single day, with flexible hoursto fit in with your working schedule, and all of our work is 100% guaranteed. We can also arrange for a regular office cleaning service whereby one of our trusted cleaners will come and give your office a spruce up on a daily, weekly or monthly basis. We are well known for our high levels of customer service, so don’t hesitate to give us all call on 020 3404 5124 or arrange an appointment via our online form. One of our friendly staff is looking forward to hearing from you! Office cleaning – “My office needed some serious cleaning after some time of using. My friend recommended Friendly cleaners. I contact you on the phone. The representative that I spoke with was very helpful and I arranged my office cleaning service with no problem. The cleaners cam as scheduled and polite. Their job was effective and they had an eye for the detail. As a result my office is noticeable clean for everyone. Thank you!"